Some things you would want to bring would be your paper products, paper towels, tissue, and extra toilet paper(we start each rental with 1 roll). You’ll want to bring your beach towels, since the cottage bath towels need to stay in the cottage. Also, we start each rental off with a kitchen and bathroom plastic garbage bag but you will need to supply your own garbage bags for the rest of your stay. Other than that all you need to bring is all of your personal gear for your stay. Please let us know if you will be having visitors. Each visitor staying with you overnight or enjoying the property during the day will have a charge of $10. Your visitors MAY NOT bring dogs. Visitors causing disturbances will be asked to leave immediately. Visitors must park along the street. The weather in Les Cheneaux varies from 50's to upwards of the occasional 90's in peak of summer. A typical day in the area starts off cool in the mornings, warms into the afternoon and cools back down in the evening. We suggest that you bring a light coat for the morning and evening chill and a raincoat. We love dogs and we welcome well-behaved dogs to Spring Lodge. The fee is $150/week per dog, and $50 for each additional dog. Please let us know before you come if you will be bringing a dog, you must have prior approval to bring your dog to Spring Lodge. Our general rule for dogs is that they cannot bother any other guest at Spring Lodge with their behavior, noise or un-picked up poop. Your dog needs to be supervised at all times and never wandering out of your sight. When your dog goes to the bathroom it must be picked up immediately, if you have no bag you can use one of the three doggie bag stations we have across the property. Dog poop must never be left on the ground, even if it is near your cabin. Dog barking will not be tolerated. You may not leave your dog in a cabin alone if it barks. Barking at other times should be stopped immediately. If a dog is heard growling or acts in any way aggressive towards other dogs or people he or she must be on a leash for the remainder of your stay, and should be kept away from other dogs and people. Your dog must be able to be controlled even while on a leash. We have quilts available to cover the couches and chairs if your dog goes on the furniture. Please let us know if you need any so we can protect the furniture for our next guest. What are the Local Events? Spring Lodge has WiFi on Property. Due to the size of the property we cannot offer full WiFi access to every cottage on property. We do have several easy to use Hot Spots that you can connect your device. Our Main Dockhouse has comfortable tables and chairs all with a great view of Snow's Channel and Full WiFi Signal. The Les Cheneaux Island's Waterways are loaded with Pike, Perch, Bass, Lake Trout, Sunfish, Catfish and the occasional Walleye. Live and artificial baits work well depending on time of season. Spring Lodge is centrally located in the Les Cheneaux Islands. We have a grocery store, gas station, Dollar General, Post Office, Bait Shop, Hardware store, Gift Shops, Fish Market and several places to dine and refresh. 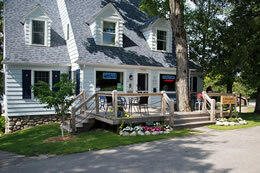 The Spring Lodge is within a short walking distance of Snow's Bar and Grill. The Les Cheneaux Islands are also home to the Les Cheneaux Culinary School and Les Cheneaux Boat School. A deposit of 50% of the Cabin rate per week is required. Early arrivals (arriving before 3pm) please contact us we can have your cabin ready. There is a charge of $10.00 a night or $50.00 a week per adult, $25.00 a week per child, above 4 people in a cottage. We accept cash, check, or credit card. Credit cards will have a 3.5% service fee. All cottages have ranges, refrigerators, and automatic heat. Linens furnished, bedding, bath towels, and kitchen towels. Complimentary kayaks, canoe, paddleboats, and bicycles. Fish cleaning tables with running water. Dogs welcome - $125.00 per week. Tents and campers not permitted. To do: Meet Owners, Find Cottage, Find Boat, Unpack, Relax Relax, Fish, Sit at beach, Smile Fish, Relax, Have Campfire Fish, Relax, Have Another Campfire, Swim and Smile some more. Sad because you have to leave.